WP Admin White Label Login is a premium WP login page customization plugin that can be used to customize your default login page with the WordPress Customizer options. Packaged with 25+ beautifully pre-designed templates, the plugin offers lots of customization possibilities. With no coding skill, you can create an outstanding login page in no time. This fully customizer based plugin comes with intuitive interface that allows you to configure your admin login page as per your preference. The plugin supports image/video background. 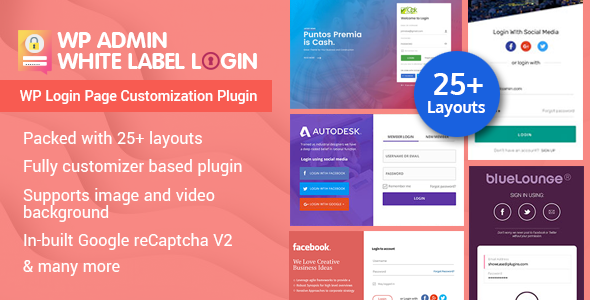 It includes inbuilt Google reCaptcha version 2, inbuilt Social Login, 20+ social icons. WP Custom Admin Login is an ultimate plugin to customize your admin login page in a unique and stunning way. We have listed all the options available in the plugin. Fully Documented with easy Configuration and video guidance. If you still have any queries you can drop us a comment and we will get back to you.